John Pollock and Wai Ting check in from New York with Day 3 of their WrestleMania Road Diaries. 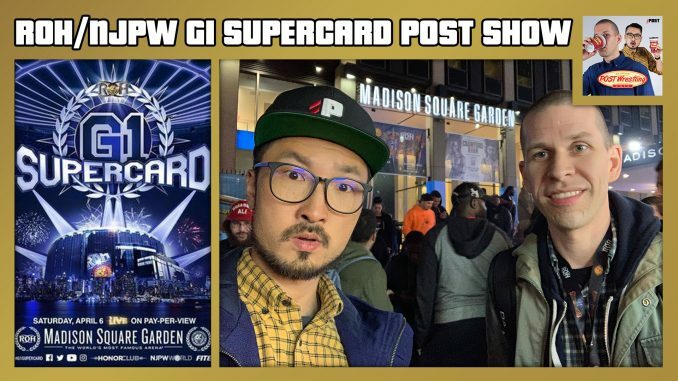 We review Ring of Honor and New Japan’s G1 Supercard from Madison Square Garden with Kazuchika Okada regaining the IWGP heavyweight title, Matt Taven wins the ROH title, Tetsuya Naito vs. Kota Ibushi, the debuts of Enzo and Big Cass, the good and bad from the show & more. Plus, an update on the Bret Hart incident at the WWE Hall of Fame where he was assaulted by a spectator with the WWE’s statement on the matter and other notes. **Grab your tickets for POST Wrestling Live in New York on tomorrow with a special Q&A show with John Pollock and Wai Ting at the Broadway Comedy Club. Q&A will start at 12 pm with a special meet-and-greet before and after the show at 11 am and 1:30 pm, exclusive tees, vintage wrestling apparel from 3 Faces of Poli.